My interest was recently piqued when I tried a hypnosis technique at a work event. The technique involved making a small ball on a chain move in certain directions on a piece of paper. It essentially looked as if my mind and not my hand made it move. Not only was I astounded, I was also quickly sold on at least seeing what this was all about. 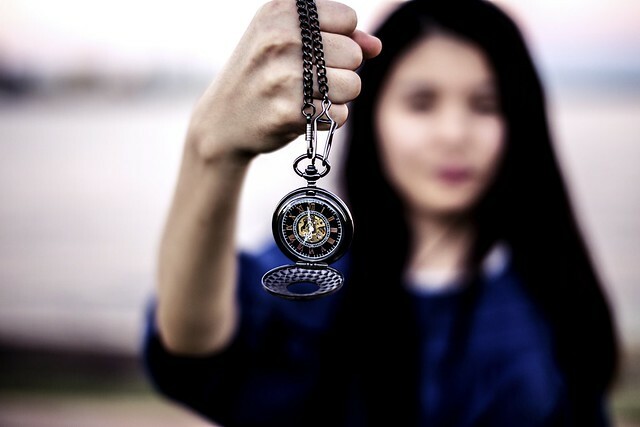 Hypnosis is a process where one induces a trance-like state with the help of a hypnotist and then experiences heightened focus and concentration. Once in the trance-like state, the hypnotist feeds the participant both images and affirmations to help create a state of relaxation, thus making the patient more open to suggestions, like breaking free of a habit or flying on a plane. I was drawn to the hypnotist’s table at the health fair out of curiosity but I had my doubts. I assumed it was either junk science or if it really did work, then it was something I wanted no part of, since I hate being out of control. However, one of the first things I learned is that in a properly facilitated hypnosis session you do not ever lose complete control over your behavior, nor do you forget what happens in the session. You should be able to recall every part. During the hypnosis session, the hypnotherapist starts out by asking questions about your goals. For my experience, I chose to experiment with hypnosis as a way of helping me focus on my upcoming marathon. (My process goal is to be able to stay focused during the race when discomfort set in and my specific goals are to run a Boston qualifying time as well as finish in the top 3.) The hypnotist gathers as much information as possible and then moves on to the next phase, which my hypnotist referred to as the trial phase. In the trial phase, the hypnotist uses some basic focusing techniques to begin to prepare you for the trance state. For my session, the two techniques used were similar to those from the health fair. For example, he had me close my eyes and use my hands and legs to demonstrate holding balloons in one hand and a 20lb weight in the other. If one can easily fulfill the demonstration, the hypnotist moves on to the trance phase. You are now under my spell…or not. The trance phase sounds somewhat scary but again, you are never entering into complete unconsciousness. The goal in this phase is to get you in a relaxed state of mind so that when the hypnotist helps you visualize vivid, meaningful images of you achieving your goals, your subconscious is absorbing the information for you to recall at a later date, such as race day. During my session, I was quite relaxed and able to let go for the most part. The hypnotist I saw stated that it usually takes three times for one to become comfortable with entering a hypnotic state. However, what was nice about my session was that he wasn’t forcing additional sessions on me. We had done a total of 7 trance states and his observations were that I seemed to easily be able to relax. Without an open mind, hypnosis is likely to not be effective. My hypnotist was funny, kind-hearted and easy to talk to. Even though he didn’t know a lot about running, he wanted to learn more so he could help with creating the images and affirmations. I had to laugh at one point when he mistakenly said, “You WILL win the Boston Marathon” and then quickly took back his words and said, “You WILL qualify for the Boston Marathon.” Eh, I guess you never know. I think I’ll keep the first affirmation tucked away neatly in my sub conscious just for fun. If you are interested in trying out hypnosis for yourself, be sure to go through a therapist who is certified, since they are bound to both ethical and professional standards of practice. The National Guild of Hypnotists can help you find a certified therapist in your area on their site. Also, hypnosis may be counterproductive for those with severe mental illness or those who have previously experienced trauma, as certain techniques run the risk of creating false memories or re-triggering difficult and scary memories. In all, hypnosis is meant to be an effective method for coping with stress and anxiety. And if everyone’s posts about the taper crazies are any indication, when it comes to running and racing, we could use all the help we can get. If your anxiety is getting the better of you, hypnosis is another tool you may consider adding to your box. Have ever tried hypnosis? Is it something you would try for improving your running? Interesting! And certainly something to consider. My question or concern is: Where do these “vivid, meaningful images” come from? Seems to me there’s a strong possibility for ineffective or even harmful/counterproductive “programming” (for lack of a better word) here if the hypnotist doesn’t really know the client or the milieu in which the client will be performing. For example, the suggestion that, “You WILL win the Boston Marathon” – probably not harmful, but not particularly helpful. If nothing else, it’s the sort of statement that could easily jar a person out of a trance-like state and make them less open to further suggestions. Good point, Liz. We spent about 30 minutes talking before doing the techniques so that he took in my goals to then be used as affirmations later. When he messed up, he corrected himself. This didn’t effect me because he corrected himself so quickly. But I could see how that could have easily messed up my trance state. If that was the case, all we would do is start over. On the harmful side though, past life regression is a pretty controversial form of hypnosis. That I wouldn’t do but there are many who practice it. I think it runs the risk of creating false memories but at the same time, it all depends on the person. If one believes in a past life and has a good imagination, they are more apt to do ok with that technique. It’s entirely unrelated to running, but hypnosis helped my 6-year-old to stop wetting her bed. I was quite skeptical at first, but I wanted a method without alarms and the like, which would have waken up the whole family and made our lives miserable. It was also WWAAYY less expensive. She had to listen to the recording of a little story (which contained hypnotic suggestions) at bedtime, while she fell asleep. She started waking up to pee after a couple of days, then after a month, she was “accident-free” and she slept through the night. Before that, she was sleeping in a pull-up because she would wet herself every.single.night. I am now a believer! I am not very performance-oriented, so I don’t think I’ll use hypnosis for running, but I could see myself using it to help me change bad habits, for instance. It’s worthy to note that it’s also possible to learn self-hypnosis and make your own suggestions. Wow, this is great to hear, Annie! I wish I could’ve had this option as a child with nightmares. It seems like having a tape with stories and subtle suggestions could go a long way for helping a child with any type of behavior or emotional issue. Thanks for sharing and glad to hear about you and your family’s positive experiences.